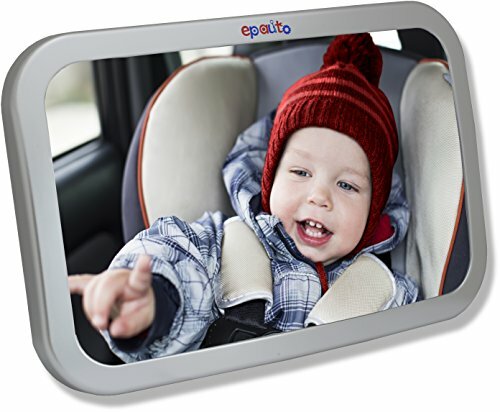 EPAuto Baby Car Back Seat Mirror for Baby and Mom Rear Facing View, Wide Convex Shatterproof Glass and Fully Assembled Crash Tested by EPAuto at Spoil the Baby. MPN: MI-003-1. Hurry! Limited time offer. Offer valid only while supplies last. Fitting Instructions: 1. Raise head restraint. 2. Wrap strap underneath head restraint. 3. Pull the strap to secure the mirror to the headrest. 4. 2. Wrap strap underneath head restraint. 3. Pull the strap to secure the mirror to the headrest. 4. Lower head restraint down to secure in place. 5. Rotate mirror to desired angle to give you the best view of your baby from vehicle's rear-view mirror. 360º ADJUSTABLE VIEW - Designed to see baby in rear facing car seat while driving. WIDE ANGLE LARGE CONVEX MIRROR - Easy to check on baby and keep attention on the road at the same time. SAFTY TESTED - Shatter-proof safety surface protect your little one from an accident. LARGE SIZE - W 11.5" x H 7.5"